Sergeant Joe Baerclau rarely shows any outward emotion, but when his gray eyes begin to smolder, his men know it’s time to get out of his way or follow him into action. 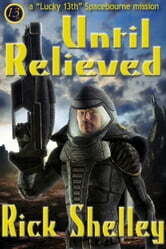 Corporal Ezra Frain is a veteran at age twenty. The tall redhead has joined the 13th after helping fight off the enemy’s invasion of his home planet. Now he’s ready to give that enemy a taste of his own poison. Private Mort Jaiffer is the “old man” of his squad at twenty-seven. A former college professor turned soldier, he turned down a chance at officer school to be a private. Private Kam Goff had never seen combat before landing on Porter, but before the end of his first day on the ground, he’d seen enough to last him a lifetime.